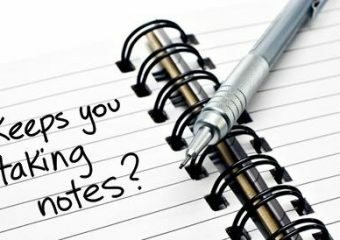 Why is note taking so important? When you passively sit in class, listening your lecturer, the lecture is stored within your sensory memory. The sensory memory has a very large capacity to store information, but cannot retain this information for a long period of time. You have to actively transfer this information into your working memory, by taking notes in class so that you can later re-read this information, re-absorb and re-understand it. This is called using your working memory. When information is stored in your working memory, you’re brain relates this information to other information that you’re brain has previously stored; allowing you to make connections between old and new information, and thus remember and relate notes from (for example) Week 1 to Week 4. Pauk, W. (1989). in his book How to Study in College (4th Ed.). Boston, MA: Houghton Mifflin. pointed out the cornell note taking system. As a rule, practice writing you’re notes on half of the sheet of paper; and then leave the rest of the sheet blank. Then, either during the lecture or while reviewing the notes later – use this blank half sheet to write down questions you have about the lecture or thoughts and doubts about the material. You can also use this space to summarize the material in your own words so that you can learn it easily later on. You can also make connections with previous information or lectures in this space. For example, instead of writing “increase”, perhaps just use this symbol: ↑. Also, if one particular name is being repeated several times in the lecture, such as Robert Brown – after writing Robert Brown down the first and second time, make an abbreviation such as RB. This will save you time and allow you to record all the information necessary instead of scrambling and missing important points. After a while, you will become such an efficient note taker, that you will have time to listen to the lecture and simultaneously write down the information in your own words. Thus, by saving time during the actual writing, you can also begin to absorb the information that your lecturer is relaying – rather than just focusing on listening to the lecturer and hurriedly writing down every thing (s)he says. Now, you can listen, understand and then write down the important points in your own words. Remember, notes written in your words are also easier to understand, absorb and retain. At this point, you are starting your learning process right there in class, and thus saving time by having to understand the lecturer’s language, which is often more formal and technical. Make a little star or symbol next to those notes to remind yourself to study it thoroughly. Similarly, if you’re lecturer says that something is important, then make the same little star or symbol. While reviewing you’re notes, ensure that you understand these concepts entirely and can recall them quickly. One of the things you can do to ensure that you are doing a good job of taking notes is to work with a checklist. Use this checklist several times to make sure you are using good note-taking practices. Note the date or occasion when you practiced good, active note-taking and check off the elements you completed.